David Bowie is the eponymously-titled debut album by rock musician David Bowie, released in 1967 by Deram Records, a Decca offshoot. Its content bears little overt resemblance to the type of music that later made Bowie famous, such as the folk rock of "Space Oddity" or the glam of The Rise and Fall of Ziggy Stardust and the Spiders from Mars. NME critics Roy Carr and Charles Shaar Murray have said, "a listener strictly accustomed to David Bowie in his assorted '70s guises would probably find this debut album either shocking or else simply quaint", while biographer David Buckley describes it as "the vinyl equivalent of the madwoman in the attic". 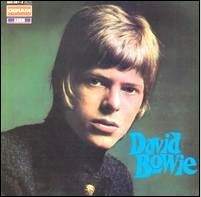 David Bowie was released in the UK, in both mono and stereo, on 1 June 1967, the same date as The Beatles' Sgt. Pepper's Lonely Hearts Club Band. It was issued in the US in August 1967, minus "We Are Hungry Men" and "Maid of Bond Street". The album and its associated singles were all commercial failures at the time and Bowie did not release another record until "Space Oddity", two years later. The songs from the debut album and its singles, plus later Deram works, have been recycled in a multitude of compilation albums, including The World of David Bowie (1970), Images 1966–1967 (1973), Another Face (1981), Rock Reflections (1990), and The Deram Anthology 1966–1968 (1997). A number of the songs also appeared in Ken Pitt's promotional film Love You Till Tuesday, shot in 1969 but kept on the shelf until 1984, when it was released to video with a companion album on CD.